The slopes of High Street are to the right, dropping down to the valley of Hayeswater below. The ridge from High Street leads down to the Straits if Riggindale and then up to Rampsgill Head. 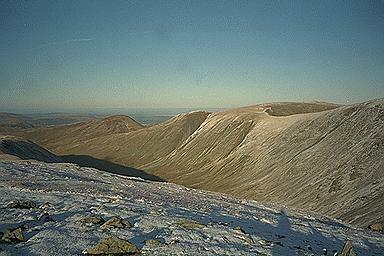 The Knott is in the centre of the picture with Rest Dodd to the left. On the extreme left is the ridge leading to Gray Crag, with Place Fell far beyond. Larger version of this picture.